Help increase dignity and independence. With the True Link Prepaid Visa® Card, you can help empower residents with more autonomy to make purchases while saving staff time spent managing petty cash. The True Link Card helps residential staff manage and distribute spending money without the need for petty cash or checks. Reduce collecting and distributing petty cash in person and manually rebalancing accounts. Enable families to fund the card from our online dashboard. No matter the level of care, dignity comes from independence. Give that gift to residents who will have a reloadable card they can use at approved merchants. Feel confident that residents are spending money safely by setting restrictions on merchants and spending limits. Allow only merchants you approve. 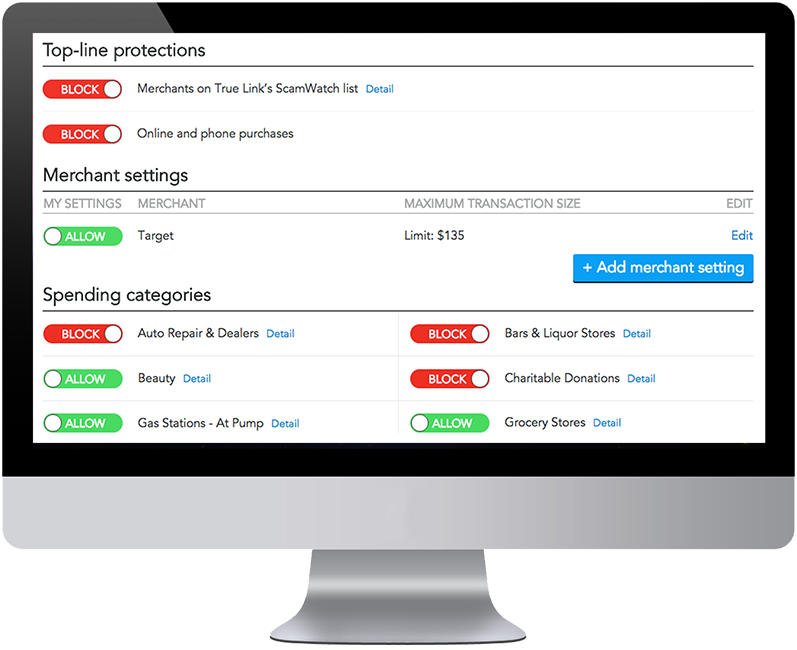 With the True Link Card, you can monitor, manage, and limit spending so that residents can make purchases on their own, while helping to prevent unsafe purchases. You can customize the card to meet any unique needs and transaction reports are downloadable. If an unapproved purchase or withdrawal is attempted, the card will automatically block the transaction and alert* you right away. 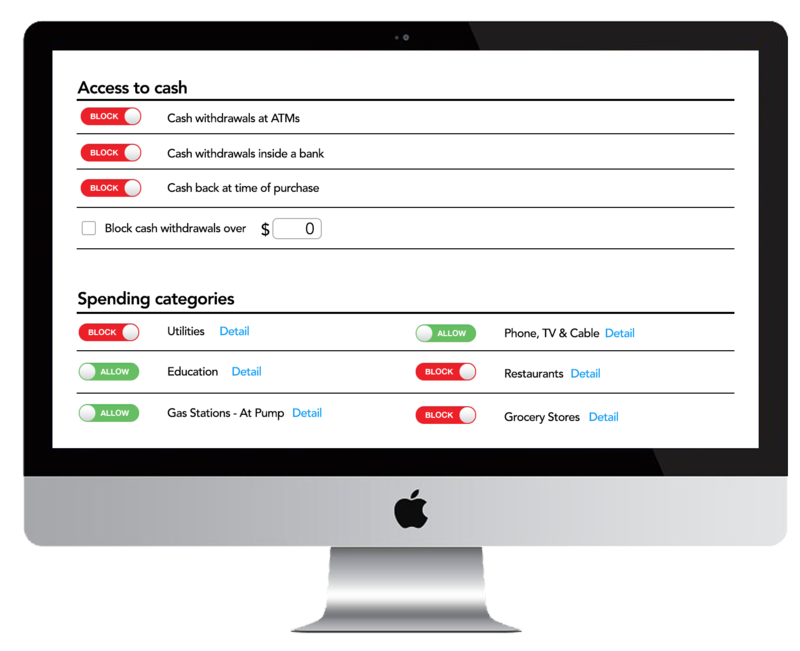 It’s easier to use and simpler to manage than petty cash. Caregivers can use the card, too. With our user-friendly online dashboard, it's easy to customize the card and view purchases. Limit funds available and set a transaction limit. Allow only gas, clothes, and pharmacies – and nothing else. Have specific stores in mind? Want to see where and when purchases were made? Block ATMS, cash back at merchants, and bank withdrawals. Family members are also welcome to manage or fund cards. They can see that their loved one is actively enjoying the independence of having a card and check that the right items are being purchased. 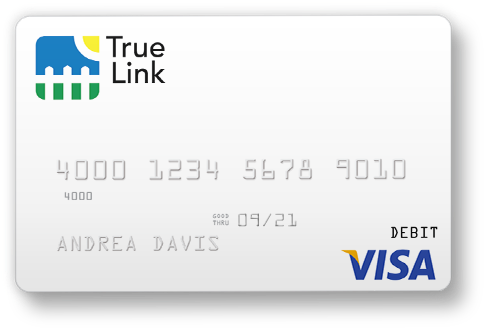 True Link Cards are reloadable prepaid cards that can be used for everyday purchases – like buying medication at the pharmacy, grabbing lunch with friends and family, or buying a magazine – everywhere Visa debit cards are accepted. You can do all this online or sign up with the help of a True Link team member by calling 866-984-8576.